A wooden train car is the most important part of a wooden train track set. You could spend hours imagining and creating the most complicated railroad systems, but it’s all for nothing if you don’t have a train car to go through the paths you created. The Fisher Price Train Cars for Wooden Tracks has a wide variety of train tracks you could choose from. People tend to put less emphasis on these train cars and tracks, but a lot of collectors value the variations available on the market. Fisher-Price has a wide variety of wooden train cars to choose from. If you’re a fan of the Thomas & Friends television series, you’ll recognize a lot of these train cars. Every one of these has its own unique twist which is why you have to make sure you pick the right one before you buy it. Avid fans of the Thomas & Friends television series will love this wooden train car, especially since it’s Thomas himself! Aspiring railway conductors can now watch Thomas travel around the tracks they’ve personally set up. Thomas can be connected to the different Wooden Railway engines and vehicles using small magnet connectors. This one is the perfect choice for people who already own Thomas & Friends Wooden Railway train sets. Thomas is battery operated and can move around the track without manual assistance. Easy to toggle on and off switch. The face of the Thomas & Friends television series. Anyone who’s ever owned a wooden train track has probably seen an episode or two of Thomas & Friends. That’s why it’d be an overall unique experience to witness Thomas himself run your railroad track without any assistance required. Just switch him on and off he goes. Easily one of the most recognizable wooden train car pieces available on the market, your children will be ecstatic to see their favorite train car turn those corners and cross those bridges in the comfort of their home. The button to turn the engine off and on is sensitive to the touch and can prove to be frustrating if your children can’t keep their hands off the train car. This wooden train car is a must have not only because Thomas is a famous train car, but because of the attention to detail on the piece itself. It definitely brings an authentic feeling knowing that your children may very well create his own Thomas adventures with him as the conductor. Thomas just hauled in a special cargo car! This wooden train car set features a Thomas ready for festivities and a cargo car containing a light-up birthday cake. The prop cake even plays the Thomas & Friends popular theme song! Thomas is decorated for a birthday celebration. Cargo car has a birthday cake that lights up and plays the Thomas & Friends theme song. The set is connected by magnet connectors that work with any Thomas & Friends wooden train cars. 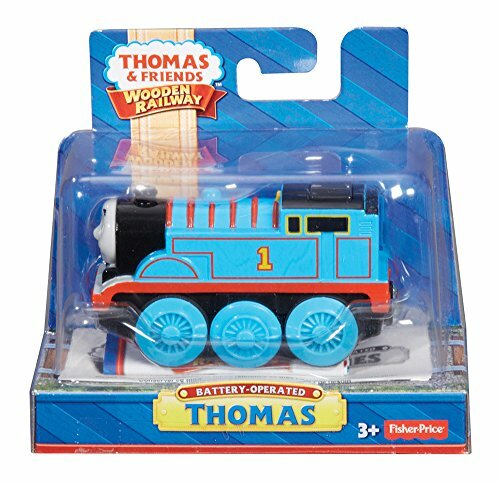 This variation of Thomas is the perfect birthday gift for children who are avid watchers of the Thomas & Friends television series. The presentation is well done and the decorations on the base of the Thomas wooden train car is neat. Unless you want a gift for a Thomas & Friends fan’s birthday, there’s really no point in picking this pack over the default Thomas. 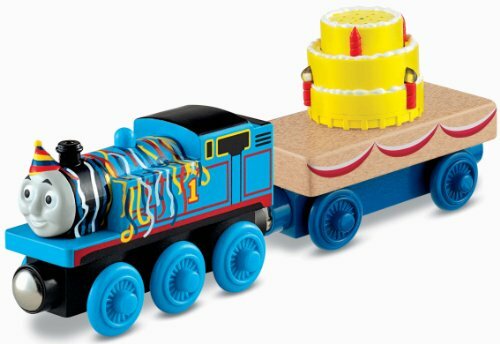 The Fisher-Price Thomas the Train Wooden Railway Happy Birthday pack is great for birthday celebrations and other festivities that fit the theme. The No. 6 green engine is here! Percy, the junior member of Sir Topham Hatt’s railway, is Thomas’ best friend which makes him the perfect companion for a Thomas & Friends wooden train car set. Made out of real wood. Magnets that can the wooden train car connect to other engines. Authentic designs based on the Thomas & Friends television series. 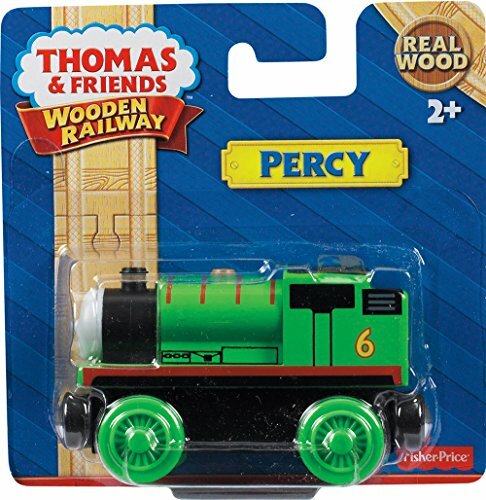 Most children will definitely ask for Percy once they get a hold of Thomas which makes this the perfect follow-up present for your kids once they grow tired of having only Thomas as their wooden train car. The wheels stick on rare occasions, but not enough to ruin the wooden train tracks. Children will love you for bringing the pair of Thomas and Percy right in your own home. This is a good pick for collectors as well. One of the earliest engines ever, Stephen may not be built to be as fast or as strong as the ones after him, but he will always be the most positive character with an endearing sense of humor on the Thomas & Friends television series. Stephen is made out of real wood. Magnet connectors make it easy to link Stephen to other engines. Attention to detail gives Stephen a feeling of authenticity. Stephen, undoubtedly one of the more lovable characters on the Thomas & Friends television series brings his bright colors as a solo wooden train car pack. Having him alongside Thomas will show just how much train cars can differ even on a miniature level. Tight turns with Stephen is almost impossible without completely derailing the jolly engine. Make sure your wooden train tracks don’t have any sudden turns to keep the spirited old engine happy. Stephen will be a great addition to any wooden train car set bringing with him an authentic old-fashioned train look even for wooden train car. As seen in the Tale of the Brave DVD movie, Marion is a railway steam shovel who just loves to have fun at the Clay Pits! Talking, digging and talking about digging are her favorite activities. Crafted using premium grade wood. Can be attached to other wooden train cars using magnets. A great addition to a Thomas & Friends train collector, this bubbly engine will surely liven up your set with its emphasis on the development of gross motor, sensory and reasoning skills. 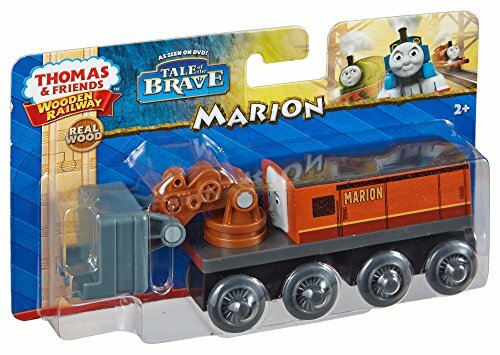 Unless your children have watched the Tale of the Brave DVD movie, they most likely won’t have any idea who Marion is. This is one of the more unique Fisher-Price wooden train cars that aims to develop certain skills of children. A must have to make learning fun. 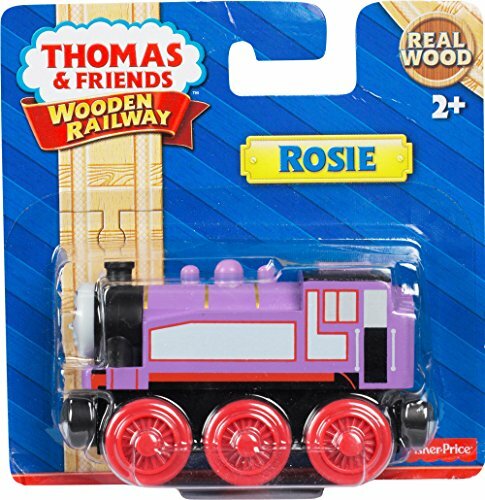 Rosie, the tomboy tank engine, is a free spirited wooden train car. She looks up to Thomas and just wants to be like him. Rosie is created with real wood. 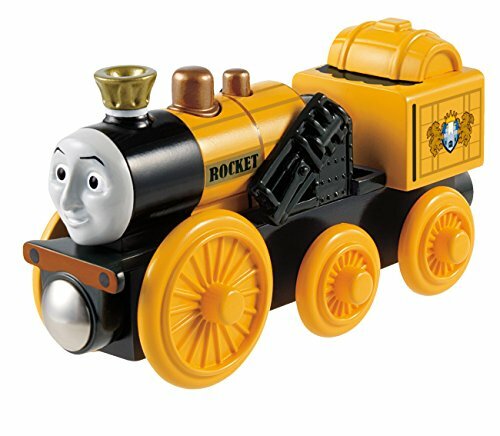 Small magnets can connect Rosie to other engines. Perfect addition to Thomas & Friends collections. Rosie the pink is one of the more fun engines on the Thomas & Friends television series which is why this wooden train car is a must have companion for Thomas and his friends. The details on the car, even her freckles, are very well done and feel authentic. The freckles were painted using a different coat which causes them to easily be worn off when rubbed. A great addition to complete your Thomas & Friends pack, Rosie will be able to emulate Thomas not only on television but right in front of your children. 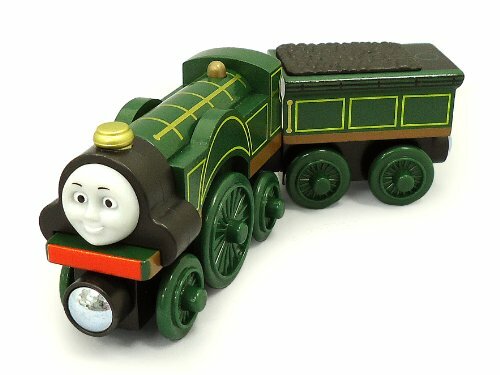 Coated in beautiful emerald green, this shiny and gleaming engine will surely catch the attention of Thomas & Friends fans. The newest member of the Steam Team, Emily makes her way into your wooden train car sets. Emily is crafted using real wood. Magnets can connect Emily to other engines. Meticulously painted wooden train car. A perfect fit for any Thomas & Friends themed wooden train car set, Emily easily blends in with the rest of the crew. The unique design of the wheels is no problem for Thomas & Friends Wooden Railway set layouts, so this is a good car to collect. The brass fittings have a coat that may rub off on skin. Fisher-Price Thomas the Train Wooden Railway Emily is a great addition for a completionist. It’s also perfect if you have a daughter that’s interested in having more female engines in her wooden train car set. 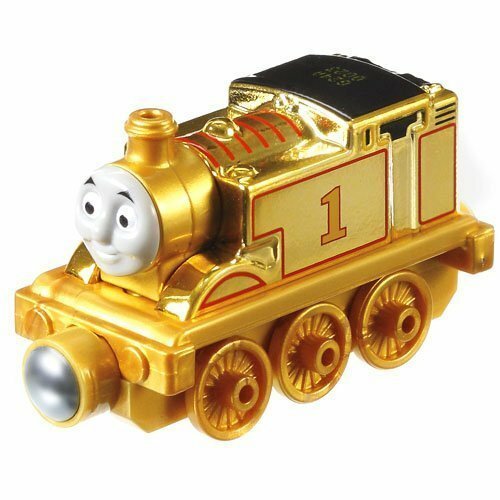 This special edition Thomas features an engine coated in shiny gold paint. As if being the flagship character of the Thomas & Friends television series was not enough, he will definitely get more attention when the light bounces off his majestic paint! Striking gold color that easily catches the attention of children. Durable and sturdy build proven to last long even when dropped. Easily the most recognizable out of everyone in the Thomas & Friends television series. This shiny edition of Thomas which says 1 on the side of the engine is a must have for those who wish to complete their Thomas & Friends wooden train car set. Golden Thomas blends in easily with the rest of the characters from the popular TV show even with his shiny coat. It’s smaller than the rest of the Thomas & Friends wooden train car characters’ engines. Golden Thomas is definitely a must have if you like displaying your collection or if your children just loves having a variety of Thomas engines around. Although smaller compared to the other wooden train car incarnations, there’s no reason to not buy this eyeful of an engine. Not only that you can use this video as a reference, you can also let your kids view this video for a fun time. This wooden train car can transport sea creatures on your tracks with its aquarium compartment! The cars are filled with liquid that light up. Inside the aquariums are the hammerhead shark and squid. It has a unique aquarium cargo containing sea creatures. The cargo cars light up. It Easy-to-use magnet that can connect the car to other engines. This unique wooden train car carries a cargo of sea creatures. What else should be told? 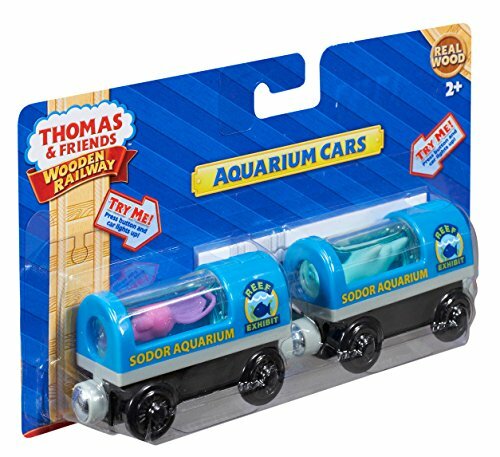 If you’ve always wanted variety in your children’s Thomas & Friends car set, then this is the right one to get. Crafted mostly out of plastic and wood compared to pure wood structures of the other wooden train cars in the Thomas & Friends set. If your children loves being a conductor, watching the Thomas & Friends television series and going to the neighborhood aquarium, then this is the perfect wooden train car to get. A unique addition to an already wide variety of available cargos for Thomas and his friends to pull with their magnetic connectors. There are a lot of wooden train cars under the Fisher-Price umbrella, but if your children loves Thomas & Friends, then there’s no reason not to get all of these collectibles. Perhaps bringing one engine home one-by-one would spice up the imagination of your children and drive them to be more creative with how they conduct Thomas in his adventures with his friends. There won’t be a lack of authenticity since all of the wooden train cars are built and designed just like the ones your children would see in the Thomas & Friends television series. Now, they will no longer be limited to just looking at the television screens, but they’ll be able to build train cars and tracks where the engines roll out too!